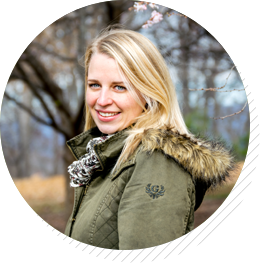 I’m Laura – a busy mom of three making healthy, easy meals in my little kitchen. Want delicious recipes for you and your family? Stick around a while! 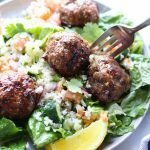 Last night, hubby and I got to enjoy an impromptu date night in with these Mediterranean Lamb Meatballs (they’re Whole30!) with Roasted Red Pepper Hummus and my favorite Cauliflower Tabbouleh. Want to know how it came to be? Let me paint you a little picture, because sure, there are nights when I make dinner with a glass of wine in hand, jazzy music playing softly, leisurely chopping and cooking, setting the table with a little dance. Last night though, I’m tossing cut up pieces of whatever at the baby in her high chair just to keep her from screaming, yelling at my boys to stop fighting in the next room, wondering if the slimy thing I just stepped in is food or something grosser because oh my goodness please let it be food, and asking whyyyyy it’s taking so long for reinforcements (my husband) to get here. I’m not an especially chill person naturally, but for some reason I just decided it wasn’t worth it to get worked up and annoyed. I threw in the towel, fed the kids some leftovers, and put them to bed early (how I pulled off a 6:15 bedtime, I’ll never know!). Enjoying the quiet in the house, I started over and made a late Mediterranean inspired dinner for just the grown ups. Because that’s what my self-care looks like sometimes – letting things slow things down, lowering the bar, so I can have a quiet, enjoyable meal for once. I can’t do that all the time, but every now and then, it works out really nicely. 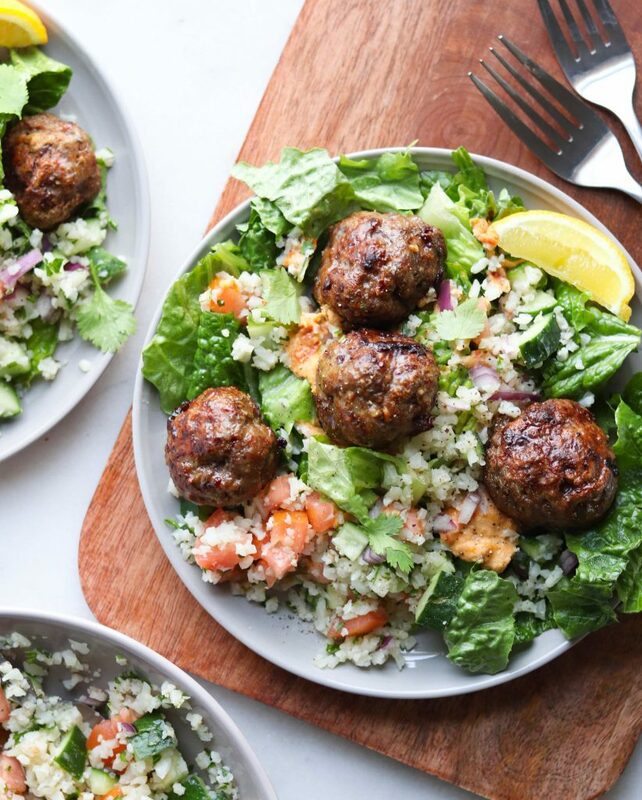 Lamb is SO flavorful in an earthy and almost-but-not-quite gamey way, so it mixes things up from the beefy flavors I automatically think of when I think of meatballs. And because it’s combined with bright and bold Mediterranean flavors – lemon, garlic, cumin, oregano, it’s really a simple meal that feels like something special. 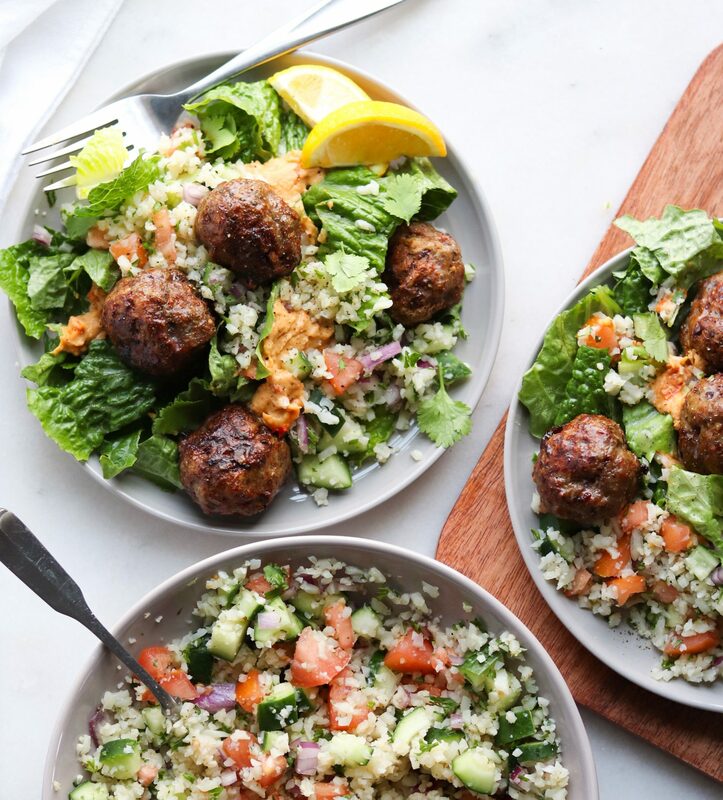 That said, if you don’t love lamb or you don’t have it on hand, feel free to swap beef or ground chicken, and it’ll still be a rockin’ bowl of Mediterranean goodness! My Cauliflower Tabbouleh recipe is super versatile! Eat it on its own, with chicken or shrimp, or on a salad like this! Here’s a Whole30 Tip: Don’t be afraid to try new things out during your Whole30! Whenever I try out a brand new recipe, cut of meat, emergency food, whatever, whether I love it or not, I notice the practice of trying something new really helps to keep me motivated. I’m 8 or 9 rounds in at this point, so I’ve had my fair share of trial and error. This is a BIG DEAL for my success, so when I make my weekly meal plan, I purposefully try plan something new once per week. That’s only four times total throughout the entire Whole30, so when I phrase it that way, it seems a little less intimidating. I’d definitely suggest it, because it always pays off for me. Not everything you try will be a home run of course, but mixing up flavors and textures absolutely helps fend off food boredom and keeps things interesting. That’s always a good thing! 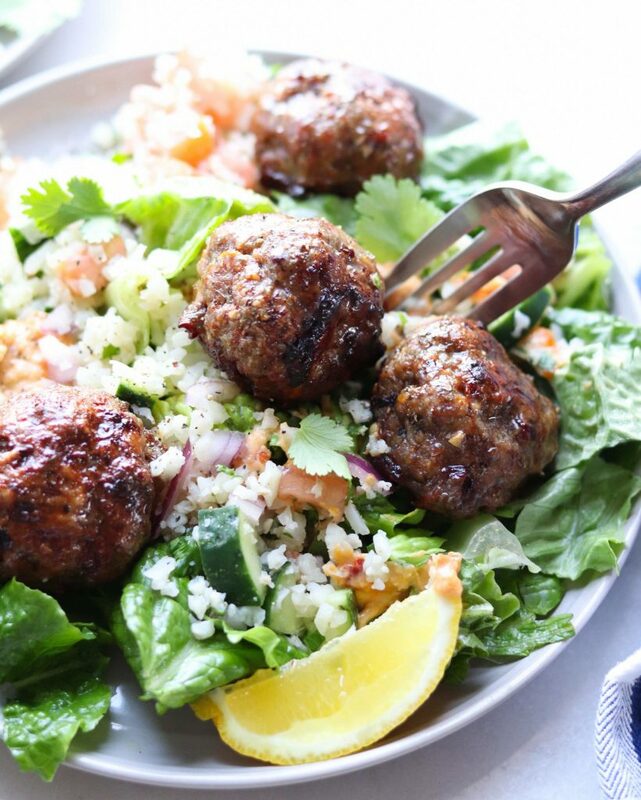 I also love that these Mediterranean Lamb Meatballs are baked for easy cleanup. I try to avoid pan frying meatballs in general just because it’s SO MUCH messier. Surprisingly, I don’t adore cleaning splatter off the stovetop and counters. I also don’t love scrubbing sheet pans either, so I usually use parchment paper (slightly more eco-friendly than tin foil), and once the drippings cool off, I just roll it up and throw it away, so it really takes almost no time at all to clean up. Sometimes I make the meatballs ahead of time, then keep them in the fridge all ready to go, baking them off quickly just before I’m ready to eat. The meatballs freeze beautifully, too! Mix together all the ingredients except the oil until well combined. Cover and set it aside for at least 30 minutes. Preheat the oven to 400 degrees. Rub a little oil on your hands, then form the meat mixture into 2 inch balls (it should make about 10 meatballs). Lay the meatballs on a parchment lined baking sheet. Bake for 18-20 minutes. If you’re using canned roasted red peppers, just skip ahead. There are several ways to roast a bell pepper, but I prefer to do it under the broiler or on the gas range. Whichever you choose, place the pepper close to the flame, and use tongs to turn it every few minutes, allowing the skin to char on all sides. Once the bell pepper’s skin is mostly charred, place it inside a ziplock bag, inside a tightly sealed container, or in a bowl and cover with plastic wrap. Allow it to steam for about 10 minutes. The skin should easily slide off when you rub it with your hands. Run the pepper under water to remove any tiny pieces of charred skin, then cut the top of the pepper off and remove the seeds. Add all ingredients to your high speed blender or food processor. Pulse until combined, then blend on medium-high until smooth. Add a teaspoon of oil at a time if necessary to get the desired texture. 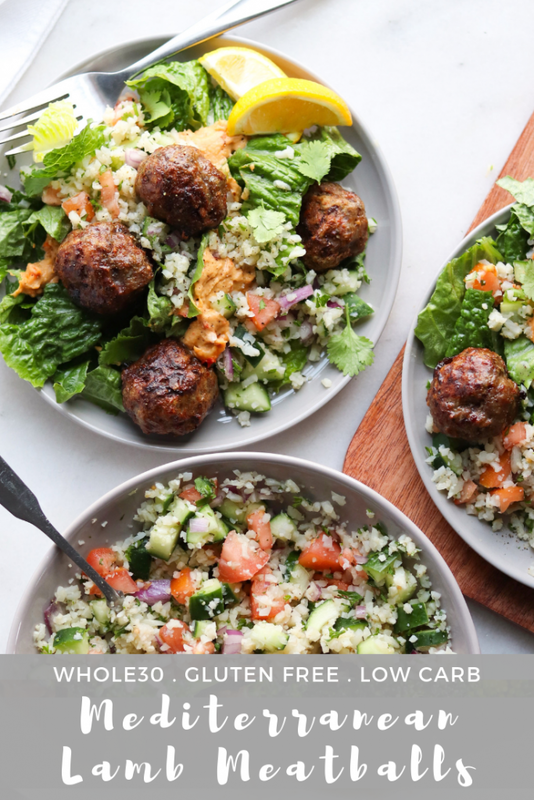 Divide the lettuce, hummus, cauliflower tabbouleh, and meatballs among four bowls and serve! 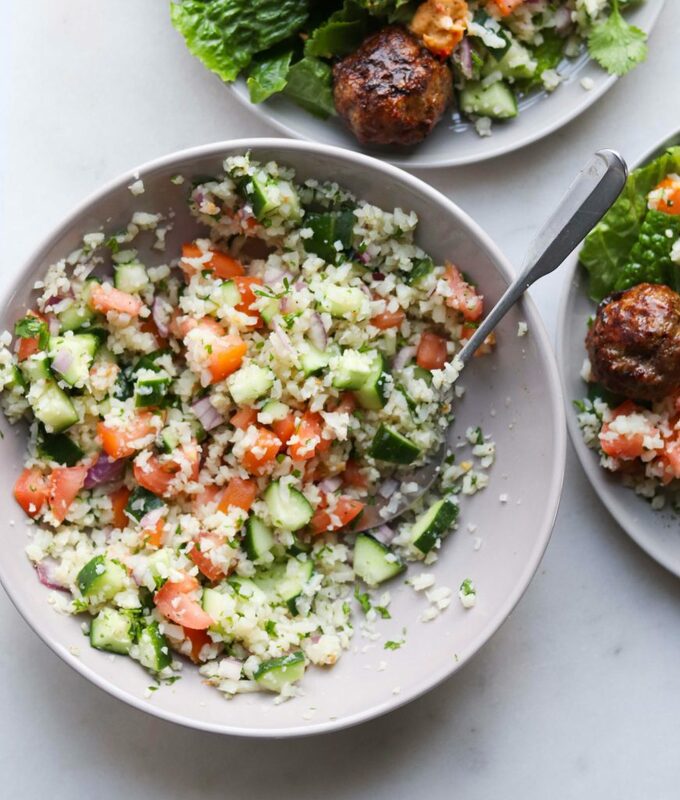 Get the recipe for my grain-free Cauliflower Tabbouleh here! Do you love lamb? Let me know in the comments below, and if you make this dish, I’d love to see! Tag me on Instagram @cookathomemom! On a meatball kick? 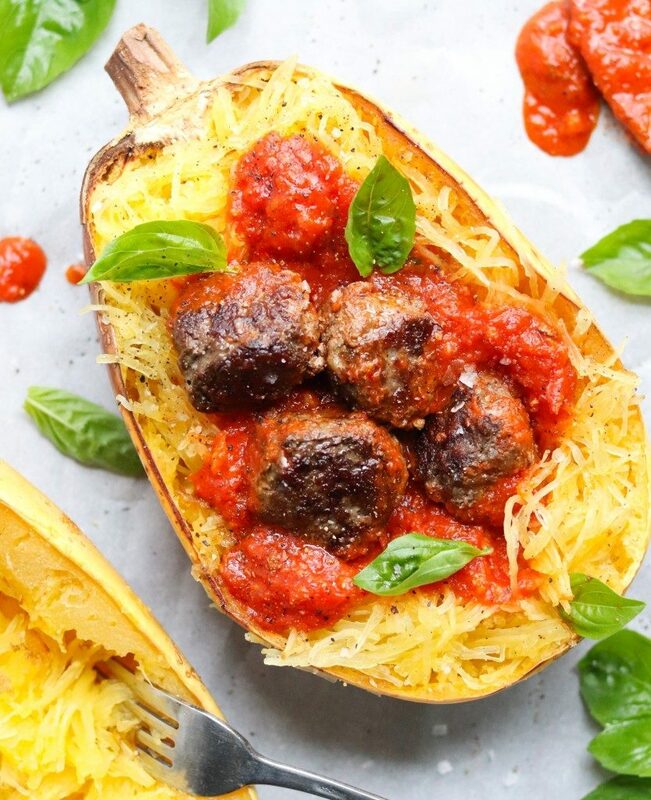 Try my Whole30 Spaghetti Squash and Meatballs Marinara recipe! I would eat Mediterranean for every meal if I could. This will certainly be on regular rotation whether whole30ing or not. Bravo!!! I agree! I’d eat mediterranean everyday too!